A revised definition of part-time employment may have some popular appeal, but it will not repair the Affordable Care Act’s disincentives for full-time employment or its extra costs for taxpayers. Part-time employment rarely includes health benefits. The lack of health benefits and the lower pay for part-time work have traditionally discouraged people from taking part-time jobs rather than full-time jobs, but both of those attributes of part-time jobs are about to change. I explained in an earlier post how, in many cases, the Affordable Care Act would almost entirely eliminate these two shortcomings of part-time employment by offering access to generously subsidized health insurance to part-time employees while denying it to most people who work full time. As a result, more people will work part time (under the law, less than 30 hours a week) rather than full time, and this will occur at significant taxpayer expense. Two senators, Joe Donnelly, Democrat of Indiana, and Susan Collins, Republican of Maine, are proposing to tweak the Affordable Care Act by changing the definition of part-time work to include any work schedule of 39 hours a week or less. They say the change conforms with traditional definitions of full-time work and will prevent workers from having their work schedules cut. Their proposal is likely to have the opposite effect. Although it may be true that their proposal would prevent cuts in hours for those now working, say, 35 hours a week, it would be likely to cause cuts for employees working 40 to 45 hours a week, because staying short of the 40-hour threshold would be closer to their current work schedule than staying short of the law’s 30-hour threshold. More important from an economic point of view, the 40-hour threshold would further magnify the already strong disincentives for working full time. The table below illustrates what may happen. The left column of the table shows the economics of a full-time position (40 hours a week). Between employer health insurance premiums and the employee paycheck, this position costs the employer $56,000 a year, or about $28 an hour. 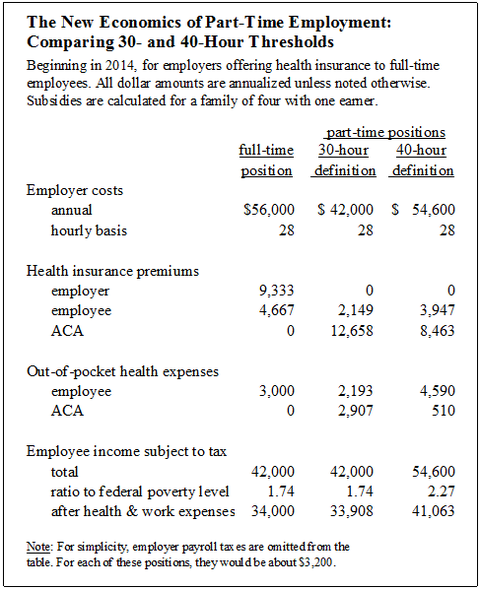 The full-time employee’s pay after his portion of health insurance premiums are withheld is $42,000. Although covered by health insurance, the employee and his family incur $3,000 in additional health costs from health insurance deductibles, co-payments and so on ($3,000 is typical for a family of four with a comprehensive health plan). The employee also has work expenses for commuting, child care and so on, which I assume to be $100 a week when working full time. The part-time columns of the table show two situations for a part-time position with the same employer cost an hour of $28. The middle column is the situation I discussed earlier, in which the full-time threshold is the 30 hours contained in the law. The right column is the situation that would apply if Senator Donnelly and Senator Collins have their way and workers become part-time by cutting their weekly hours to 39. Because the part-time position is 39 hours a week, the annual employer cost is $54,600. All of the $54,600 consists of cash compensation for the employee, because the part-time position does not include health insurance. 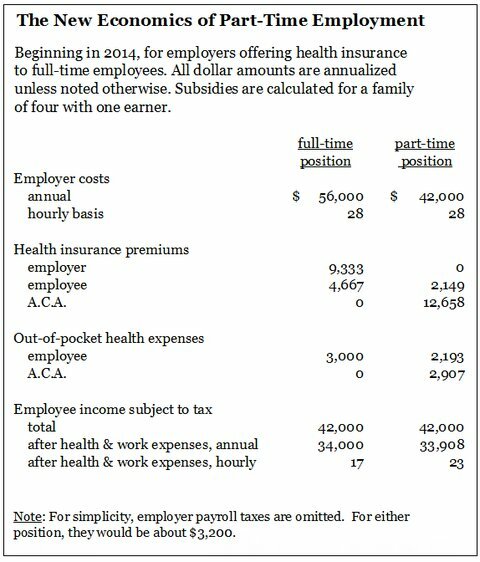 The part-time employee has to pay for his own health insurance, but the new law limits his premiums to $3,947 (the law pays the other $8,463 from the Treasury) and limits his out-of-pocket health costs to $4,590 (the law pays the other $510; by design the law increases deductibles and co-payments but uses subsidies to offset those increases for low- and middle-income families). Net of work expenses ($100 a week for both 40- and 39-hour positions) and health expenses, the 39-hour position pays $41,063, significantly more than the full-time position’s $34,000. By taking a 39-hour position, the employee can have comprehensive health insurance coverage and actually make more money than he would in a full-time position. In effect, the new subsidies totaling almost $8,973 more than fully offset, from the point of view of employers and their employees, the loss of production that occurs from working 39 hours a week rather than 40. It’s one thing for public policies to present workers with a small reward for working full time. But the proposal from the two senators would put millions of people in the position of having to pay – in the form of less disposable income – for the privilege of working full time. When millions of workers choose part-time rather than full-time work under the Donnelly-Collins proposal, it will be taxpayers who pick up the tab. The Affordable Care Act is full of disincentives. But tweaking the law without carefully considering incentives is likely to increase the law’s damage to the labor market and its depletion of taxpayer funds. Even without employer penalties, part-time work will become more common next year and more expensive for taxpayers. Much attention has been paid to people without health insurance, but for the purposes of understanding the entire labor market we must acknowledge that the uninsured are a minority of the population. Most of the work force has health insurance through full-time employment or through a spouse’s employment. Beginning next year, the Affordable Care Act will subsidize the health expenses for non-elderly families with income of 100 to 400 percent of the federal poverty line (about half of the non-elderly population has incomes in that range), but only if they are not offered health insurance through an employer. In other words, the new subsidies will not be available to most of those who do full-time work. Because part-time workers will be eligible for the subsidies except in the rare instances in which their employer covers them, full-time work will no longer carry the advantage of access to health insurance. That by itself will encourage more people to seek part-time work. Moreover, the subsidies will many times be generous enough that workers can make as much money in a part-time position as in a full-time one. The table below illustrates what may happen. Although covered by health insurance, the employee and his family incur $3,000 in additional health costs because of health insurance deductibles, co-payments and so on ($3,000 is typical for a family of four with a comprehensive health plan). The employee also has work expenses for commuting and child care, which I assume to be $100 a week when working full time. The part-time column of the table shows a part-time position with the same employer cost per hour: $28. Because the position is part-time (only 30 hours a week), the annual employer cost is $42,000. All of the $42,000 consists of cash compensation for the employee, because the part-time position does not include health insurance. The part-time employee has to pay for his own health insurance, but the new law limits his premiums to $2,149 (the new law pays the other $12,658 from the United States Treasury) and limits his out-of-pocket health costs to $2,193 (the new law pays the other $2,907; by design the new law increases deductibles and co-payments but uses subsidies to offset those increases for low- and middle-income families). After work expenses ($75 a week for part-time employment) and health expenses, the part-time position pays $33,908: almost exactly the same as the full-time position’s $34,000. By taking a part-time position, the employee can have comprehensive health insurance coverage and make almost the same money as he would in a full-time position. Thus the two traditional deterrents to part-time employment are disappearing. In effect, the new subsidies totaling almost $16,000 offset, from the point of view of employers and their employees, the loss of production that occurs from working 30 hours a week rather than 40. None of the above relates to the employer penalties associated with the new law, because the employers covered by my example avoid the penalty by continuing to offer comprehensive insurance to full-time employees. Those penalties create yet another set of reasons that part-time employment will become more common next year. Shifts from full-time to part-time work will be remarkably more attractive for employers and employees than they used to be, and taxpayers will be picking up the tab.